Crisis has become a household word and the attack on the value of labour power an everyday reality. Such an attack had already been stamped on capitalism’s genetic code by the restructuring of the ’70s–’80s, but the crisis of restructured capitalism gave it an enormous impetus. From struggles of waged workers anxiously demanding to remain such and mobilisations of pensioners defending their survival, to the outburst of rage of the ‘feral class’ in developed countries, to violent workers’ riots in the South-East Asian global factory, and all the way through to the Arab Spring and its aftermath, hard evidence of the continuing conflictuality of social reality forces even the most unrepentant end-of-history sopranos to refresh their repertoire. Admittedly, not everything bathes in perfection. But it would seem that there is good news too: nobody has to worry about where this world is going, it is a one-way street, just keep on going. Some changes in management personnel are graciously offered, the persons reciting the ‘no alternative’ mantra can always be renewed and even bear the socialist flavour. Of course, the remnants of a once optimistic citizenism keep formulating ‘proposals’ – ever less far-reaching, ever more restrained – begging capitalism to mend its ways, but nobody seems to take these noble souls seriously enough, since they dispose of no high-placed interlocutor with a receptive ear. Still, there are struggles, outbursts, riots, serving as a reminder that class struggle is always there and that capital, today no less than yesterday, is a ‘moving contradiction’. Hand in hand with it, the critical theory of its demise is being produced: history in the making is also the making of theory. Communisation is no longer being perceived as an exotic beast, and it even tends at times to become a fashionable word. Present-day struggles highlight the end of the classical workers’ movement, together with its ambition to take the supposedly good-by-nature core of the economy away from voracious capitalist predators and run it itself. It is almost obvious that the world of our days, matter and soul alike, is the world actually produced by and for capital; that, therefore, workers and their products would have never existed as such if capital had not called them into existence in the first place; that working people’s demands have nowadays become asystemic or, in other words, a scandal akin to high treason; that proletarians are forced to defend their condition against capital but, in this struggle, actions that hurt capital are also actions that tend to call into question the proletarian condition; that communism cannot possibly be conceived as a program to be realised, but only as the historical product of proletariat’s struggle against capital and, at the same token, against its own class belonging; etc., etc. All this is reassuringly easy to show, almost worryingly so in fact. This entry was posted in ΘΕΩΡΙΑ and tagged ΘΕΩΡΙΑ on March 29, 2014 by simeioseis. Thousands in Fujan province China furiously protested to stop the construction of the Blue Ocean Chemical Plant. Paracycline or PX plants have been a continued point of contention in China in recent years. Brief exposure to PX causes irritation in the eyes and throat while direct exposure is fatal. The same Blue Ocean Chemical plant in Fujan that people protested this weekexploded in June 2013. Villagers say the local government has not adequately demonstrated safety measures to solicit the views of villagers before the introduction of the project and forcibly started construction, causing the surrounding residents extreme dissatisfaction. Report of Nov 2013 protest. 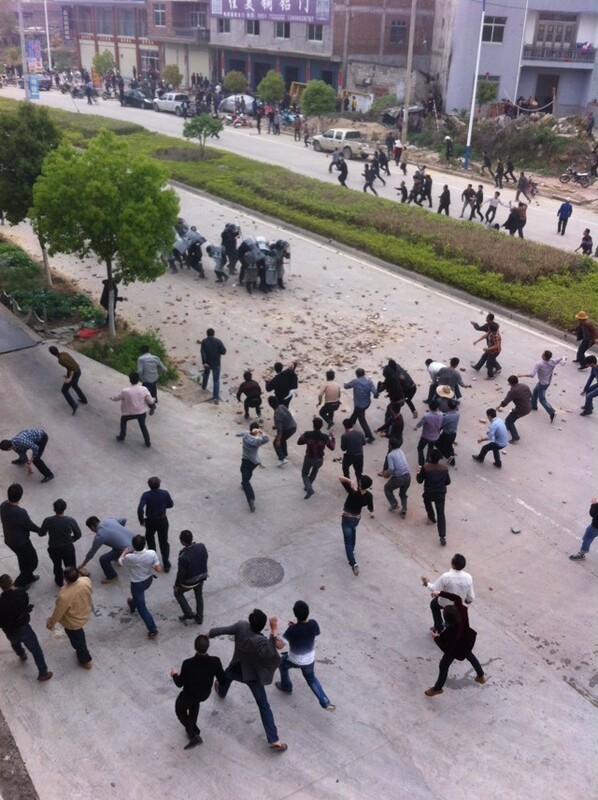 Thousands of villagers besieged Cang River border police station, throwing bricks and confronting hundreds of riot and armed police. The police station door was knocked down and many vehicles were damaged. Incident caused wounded people on both sides and a number of villagers were arrested. This entry was posted in ΝΕΑ ΑΠΟ ΤΟ ΜΕΤΩΠΟ and tagged ΚΙΝΑ, ΤΑΡΑΧΕΣ, ΤΟΠΙΚΟΣ ΑΓΩΝΑΣ on March 29, 2014 by simeioseis.